Hot Hand 3 Wireless Effects Controller, Pedal/Controller from Source Audio in the Hot Hand series. 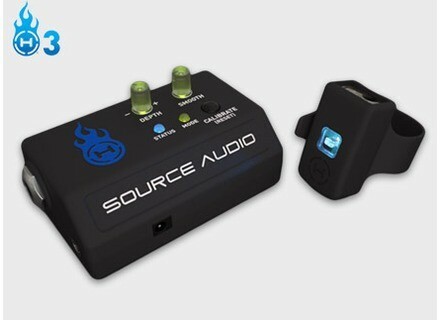 Source Audio introduces its Hot Hand 3 wireless effects controller. Hot Hand 3's receiver base station features a standard 1/4" Expression output compatible with such pedal brands as Boss, Electro-Harmonix, Line 6, Pigtronix, Eventide and more. A 3-axis accelerometer translates motion into a dynamic expression signal, which can be applied to a range of effect parameters, including filter sweeps, drive levels, modulation, and wet/dry mixes. The wireless ring is designed to be capable of transmitting over 100 feet and fit on the hand, foot, or instrument headstock. MSRP for the Hot Hand 3 Universal Wireless Effects Controller is $209 U.S. (street: $149). It is available now. New Fender Machete Head & Cabs Fender expands its amp and cab offering with the introduction of the Machete 50 Head, Machete 112 Enclosure and Machete 412 Enclosure. VOX Announces Apache Bass Guitars VOX Amplification announces the Apache Series of bass guitars. Jackson Adds New Models To 2012 X Series Jackson introduces 11 X Series guitars to its 2012 collection.